Cifonelli opened in 1880 in Rome by Giuseppe Cifonelli. London-trained Arturo moved the botique to Paris in 1926 after training in London. Adriano, son of Arturo, continued the style and craftsmanship handed down by his father and grandfather. The fourth generation of Cifonelli now takesthe helm. 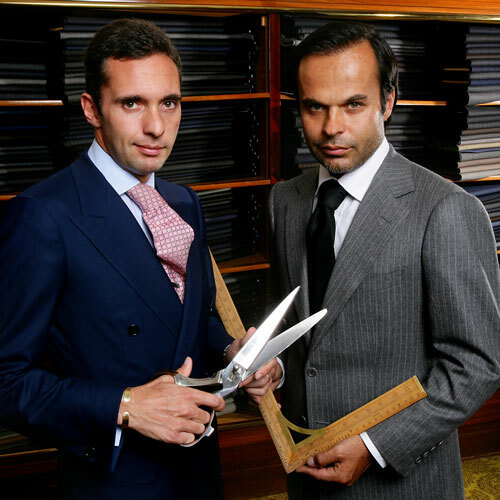 Lorenzo, son of Arturo, along with his cousin Massimo, continue the family tradition of tailoring. Over the years many famous clients have passed through the doors, from Josephine Baker to Francois Mitterrand. Cifonelli has defined the male chic look for over thirteen decades. Suit Making is in the Blood. What is disctinctive about Cifonelli style? Would you describe your jackets as debonaire? I think a jacket is not debonaire: only the man who is wearing the jacket who can be debonaire. Our suits merely underscore a man‘s elegance and his discerning tastes. Explain the French, Italian, and English influences of the suits? Our style is inspired by English structure–we are still working in inches!—as well as Italian spirit for softness and breathing, and French quality in the work and finish. Why is the shoulder cut so famous? Is there a lot of pressure on the team because of the long history and tradition of the boutique? For some years, we can see that people are going back to the traditional and artisanal work. The authenticity and personalization is now required. That’s why I’m cerain that tailoring will continue to grow and more clients will continue to want quality. Now fabrics are becoming lighter because clients don’t want to wear a suit that is too heavy and restictive. They want to wear something soft and breathable. Is there a unique material used to produce the suits? We work with all the best fabric makers in the world, especially Holand & Sherry, Drapers, Loro Piana, Dormeuil, and Scabal. Was there a collaboration with Hermes? Yes, we made all their bespoke suits for 20 years. The line was called “Hermès by Cifonelli”. For now we have stopped. Do your clients have a particular request when they come to you? In life as in style, it’s important to be proud of your choices, and especially to assume them! That’s the first thing Lorenzo and Massimo tell their clients. They like to have close relationships with customers in order to understand their lifestyle. This approach makes it easier to advise them on the type of suit to have. The clients are also inspired because they become an active part of the suit-making process. So many politicians have worn your suits over the past 130 years. Is there a political edge to your clothing? I don’t think so. They probably choose the quality and don‘t want to be too „Showoffish?“ if I may use that term. What is the history behind the Josephine Baker Suit? No specific history! We made some suits for her shows and revues. She became a friend of Cifonelli. She was just in love with the style. She also probably liked the atmosphere of the artisanal workshop. We also made looks for Marlene Dietrich. Really! Can you tell a bit more? Yes, we made some suits for Mrs. Dietrich. She wore our collection in her movies. She also became a good friend of Cifonelli. She really loved the familly spirit and the atmosphere of the workshop in Paris. What is the allure of a woman in mens‘ tailored suits? It depends on what the event the lady is attending. But the look is fitted and always modern. The strong shoulders look on a woman is inspired by the classic men style. Is there a bistro or club in Paris where people can see your suits in action for the full effect? (Wink) Probably in the luxury places in Paris like the Hotel Plaza Athenee, or the Cinq restaurant at the Hotel Four Seasons.